Universities and colleges in Illinois are committed to transforming online education. In 2010, the state adopted the Illinois Public Agenda for College and Career Success, a 10-year plan to make higher education more accessible and affordable. As part of this effort, schools are investing in quality online programs. According to the U.S. Department of Education, 10 percent of students in Illinois, or roughly 90,000 people, were enrolled in fully online programs in 2012 alone. 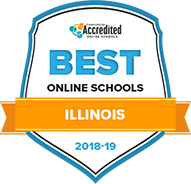 If you’re considering earning an online degree in Illinois, this page can help you navigate the growing online college landscape in Illinois, with advice on everything from paying for school to using transfer credits. Colleges in Illinois are well-known for a variety of characteristics, from the University of Illinois Medical School location in the heart of Chicago’s medical district to DePaul University’s highly-competitive theater school. But understanding what makes each Illinois college and university unique may not get you any closer to choosing the best school for your degree goals. To start narrowing your search, it’s important to pinpoint the schools who provide the best mix of important, baseline factors: quality online curriculum and a solid reputation for online student support. We’ve highlighted the online colleges in Illinois we believe are providing the best educational experience for their students. Moody Bible Institute, accredited by both the Higher Learning Commission and the Association for Biblical Higher Education, has several online bachelor's degree programs for those planning to work in ministry upon graduation while also providing a foundation for Moody's graduate programs. Its 120-credit bachelor of science degrees are offered in biblical studies, ministry leadership, theological studies and theological and cultural engagement. Students can choose 8-week, 16-week self-paced, 6-month independent study and blended courses, or a combination of these formats to complete their degrees. Another bonus for online students is lower tuition, as online credit hours cost less than on-campus credit hours. Currently, 12 fully online bachelor's degree programs are offered at the University of Illinois at Springfield (UIS). Programs are typically 4 years in length, but transfer students and those coming from nearby community colleges with accepted associate degrees can finish in 2 years. Programs vary in structure, depending on the major; some may be self-paced while others are are synchronous. Some programs, such as liberal studies, combine online and on-campus courses; some employ independent study and service learning. UIS also offers 13 online graduate degrees and a wide selection of online certificates. At the University of Illinois at Urbana-Champaign, online programs are available at the bachelor's and master's degree levels. The university also offers serveral online certificate and continuing education programs in a range of subject areas and a limited selection of doctorate degrees in education. Tuition varies based on type of program and degree level, but online students pay the same tuition rates as on-campus students. Students must meet UI admission requirements, along with specific program requirements. For example, online Earth, Society & Environmental Sustainability (ESES) students must apply as transfer students with at least one semester of prior college experience, while online psychology students have prerequisite requirements and must demonstrate inability to attend an on-campus program. Elmhurst College is a private, 4-year liberal arts institution affiliated with the United Church of Christ, and located in the Chicago suburb of Elmhurst, Illinois. Students interested in earning a degree through online study at Elmhurst are limited to 2 bachelor degree options: a bachelor's in applied psychology, with courses offered in an online/on-campus hybrid format; and a bachelor's in information technology, with some courses that can be completed online. Both options are presented in a degree-completion format only, meaning that students complete their major subject coursework through the degree-completion program after earning their general education credits elsewhere. Additionally, Elmhurst offers an undergraduate certificate in cyber security, and a graduate certificate in Geographic Information Systems, both of which can be earned fully online. Aurora University is a private, independent, nonprofit, liberal arts university whose main campus located 40 miles west of Chicago in the city of Aurora. Aurora's distance-learning program, AU Online, offers several bachelor's and master's degrees that can be earned through distance learning in subjects such as business administration, criminal justice, mathematics, public administration and social work. A general studies BA is also available, which allows students to maximize their transfer credits and course options. One AU Online program of particular interest is its Master of Arts in homeland security, which is designed for both government and private officials, including law enforcement professionals, emergency managers, firefighters, corporate security personnel and others. Established in 1920, the University of St. Francis is a Catholic Franciscan university located in the city of Joliet. USF is one of the largest online education providers in Illinois, currently serving more than 1,500 students each semester. A substantial number of undergraduate and graduate degrees can be earned through online study at St. Francis, in a wide range of disciplines that includes business administration, education, health care management and administration, nursing and many others. Of particular interest are St. Francis' two online doctorate programs in Educational Leadership (Ed.P) and Nursing Practice (DNP). Located on two campuses in Chicago, DePaul University is the largest Catholic university in the United States. Through DePaul's Online Learningportal, students can pursue undergraduate and graduate degrees and certificates in a wide range of subject areas, including business administration, communication and media, computer science and software engineering, education leadership, nursing, psychology and many others. DePaul online courses feature small class sizes and emphasize one-on-one interaction between students and professors. Most degrees and certificates can be earned entirely through online study. Some, however, are offered in a degree-completion format only, meaning the students complete their general education requirements elsewhere before pursuing their major subject courses online. Lewis University is a private Catholic university sponsored by the De La Salle Christian Brothers, located in Romeoville, Illinois, approximately 35 miles from downtown Chicago. A number of master's degrees and graduate certificates are available through distance learning at Lewis, in major fields that include computer and data science, criminal justice, public safety, nursing and organizational leadership. Master's degree programs are designed with adult learners in mind and can normally be completed within 2 years while working full time. All degrees and certificates can be earned 100% online. Western Illinois University offers several bachelor's and master's degrees that can be earned onlinein major subjects that include accountancy, anthropology, business administration, economics, education, geography, instructional design and technology, law enforcement and justice administration, nursing and more. Of particular note is WIU's National Fire Academy Fire and Emergency Services Higher Education Curriculum for firefighters, which offers two online degree options: a Bachelor of Science in fire protection services and a Bachelor of Arts in general studies that includes firefighter training. Four post-baccalaureate certificate programs (police executive administration, supply chain management, teaching English as a second language and health services administration) can also be earned through online study at WIU. Fully online bachelor's degrees at Olivet Nazarene University are accelerated programs that can be completed in 2 years or less, and are geared towards working professionals with college experience seeking career changes or advancement. The management and business programs require 128 credits, and up to 82 credits can be awarded as elective credits to those with approved AS or AAS degrees. Master's path courses are also offered as electives and serve as dual credit courses towards a master's degree. The nursing program is a 15-month program and requires an associate or diploma in nursing for admission. How can I find which online colleges offer the degree I'm looking for in Illinois? Most major colleges and universities in Illinois offer online education for various undergraduate and master's degrees as well as doctoral programs. For example, the University of Illinois at Springfield offers more than 20 online advanced degrees, and the University of Illinois at Urbana-Champaign offers a collaborative learning approach in its partnership with MOOC-magnate Coursera. Check for a directory of online programs on each school’s website for the most up-to-date information. Which online schools in Illinois will accept my transfer credits or work/life experience? Our database allows you to customize your prospective program based on courses or your life experiences. Whether you're transferring credits from another institution or anticipate having to do so, there's an online school in Illinois prepared to accommodate your situation. Distill our rankings by those institutions that accept credit for experience or those that take transfer credits from other colleges. DePaul University, for example, offers four bachelor's programs designed for transfer students with credit hours. How Much More Do College Grads in Illinois Make? According to the Illinois Public Agenda for College and Career Success, nearly half of all Illinois jobs require an education beyond a high school diploma. Moreover, Georgetown University found that high school-educated people earn, on average, $1 million less than college graduates in lifetime wages. In Illinois, there are clear gaps in earnings between occupations that require a college education and those that require a high school diploma or less. Take a look at how much more a job with the following degree requirements pays, on average. Looking at the data in the chart above, you can see that on average, employees working in positions that require a bachelor's degree in Illinois make nearly $31,000 more than those whose jobs require no college education. According to the Illinois Board of Education, Illinois has more than 270 accredited colleges and universities. Earning a degree from an accredited institution tells potential employers and other colleges your program has been recognized for its high-quality education. Accreditation also means your degree is constantly being improved to fit workplace and real-world demands. Also, keep this in mind: many employers will only offer reimbursement options if the online university is accredited. In short, ensuring the institution you've selected is accredited means you'll have access to an education that has passed the rigorous evaluation of regionally and nationally recognized accrediting bodies approved by the U.S. Department of Education. Regionally, online colleges in Illinois are all accredited by the Higher Learning Commission. Online colleges and universities in Illinois each charge students a little differently. Generally, tuition rates in the state of Illinois are higher than the national average. Tuition Discount Programs: One option to reduce tuition costs is to identify the online colleges in Illinois that qualify for the Midwest Student Exchange Program. This tuition discount partnership allows out-of-state students from Exchange Program states to receive a reduced tuition rate if attending a school based in a participating state. These states include Illinois, Indiana, Kansas, Michigan, Minnesota, Missouri, Nebraska, North Dakota, Ohio and Wisconsin. What are Illinois' requirements to qualify for in-state university tuition? Every school has different requirements that dictate how much to charge for tuition. Some charging residents less for online credits than non-residents, others may charge online students the same rate, no matter what state they are from. But the difference between resident and out-of-state tuition at the University of Illinois at Chicago, for example, can be almost $60,000 over a four-year period, which could make changing residency to the state of Illinois could be appealing. Residents of Illinois who choose to attend a college in-state may also benefit from state-sponsored financial aid offerings, like the Monetary Assistance Program. Check the in- and out-of-state classifications (e.g., dependent, independent, or member of U.S. Armed Forces) at the schools that interest you before making any decisions, and carefully review the state’s residency requirements and frequently asked residency questions. Are online credits more affordable in Illinois than other places? Online tuition rates and rules are different at nearly every online college in Illinois. The best way to understand if credits are more affordable here or elsewhere is to look at costs side by side. Take a look at the following tuition rates, comparing online programs in Illinois with other institutions nearby; see which undergraduate programs are the least/most costly for online students for 2018-2019. How can I get help paying for online college in Illinois? Carle Auxilary Scholarship – Designated for aspiring healthcare professionals who are residents of one of the 21 participating Illinois counties. Awards are given based on academic achievements, financial need, life and work experience, references and more. Golden Apple Scholars – This award is open to high school seniors as well as first- and second-year college students pursuing a degree in teacher education. The financial award isn’t the only desireable feature of this scholarship—winners also receive summer access to institute classes where they may gain their teaching experience. Herman J. Neal Accounting Scholarship – Awarded by the Illinois CPA Society, the Neal Scholarship is given to a college junior, senior or graduate-leel student in Illinois. This scholarship is one of many from the group. In early 2018, the Illinois Community College Board released its five-year strategic plan for adult education, intended to create more educational and career opportunities for adult learners in the state. Whether you're changing careers or wanting to learn new skills to grow within your existing job, adult education programs can provide the necessary stepping stones to feel confident and prepared to go out and earn a college education. During the 2016–17 academic year, Illinois saw more than 64,000 adult learners participate in meaningful skill building programs, with participants ranging from age 19 to over 60. GED Prep and Testing – For students who have would like to complet high school equivalency. Adult Literacy and ESL – Students who are learning the English language can get comprehensive training through Illinois adult education. Bridge Programs – College and career preparation programs for specific industires of need in Illinois, such as manufacturing and healthcare.